You have let our matching software find you four (or so) other people, youâ€™ve exchanged a few emails, and now you are thinking of meeting in person. And wondering what to do with these four to get your eAlliance started. Because of the matching software on our database, you know that all of you have some important issues in common. Some of you may have met, or even know each other well, but itâ€™s unlikely that you are all acquaintances. Here are some hints to get you started. Give this project a chance to be helpful. We know how busy you are, but make a commitment to your eAllianceâ€”make your virtual and actual meetings a priority, and give it some time to develop before you decide not to participate. Read and take to heart our â€œbest practicesâ€� suggestions. Mutual mentoring can really only work if all participants respect each other and encourage full participation of all group members. Each eAlliance will develop a set of ground rules for their own cohort, but there is a set of common standards that all cohorts should embrace. In any group there will be differences and conflicting opinions, but the core value of a successful mentoring cohort is one where all group members listen as carefully and conscientiously as they speak. All cohort discussions should be treated with the utmost of confidentiality and all group members should treat each other with care and concern as they undertake the mission of supporting and encouraging each other. Plan your meeting at a professional conference, but come an extra day early or stay late, so you are not constantly interrupted by sessions that someone wants to attend, or friends that want to meet with you. 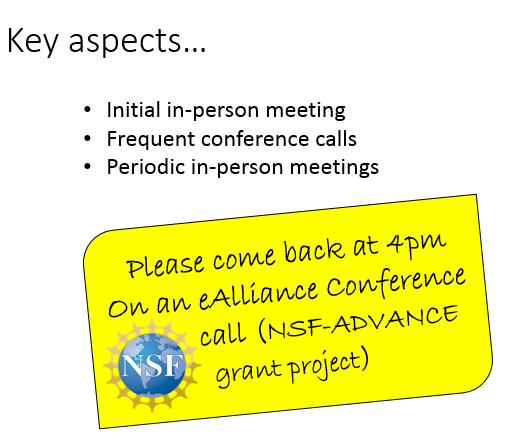 Good choices are a general or sectional APS meeting, AAPT, NSBP, or NSHP. Eat your meals together. This may seem odd at first, but it does create an informal atmosphere that is conducive to developing a good basis for trust. Be open with your co-eAlliance members. Be honest about your problems and issues, and try to avoid competition. Of course your discussions should be absolutely confidential. Be honest about work/life balance. Most women physicists experience problems with balance, and your eAlliance can be more helpful if they understand the full picture. Once youâ€™ve had a face-to-face meeting to get to know each other, plan to meet virtually on a regular basisâ€”every other week works well. To give yourselves something to discuss, you might begin by reading a relevant book. Every Other Thursday, by Ellen Daniell, describes a mutual mentoring group that has met for twenty five years. In addition to being inspirational, she brings up many topics that you might find useful to talk about. Motherhood: The Elephant in the Laboratory, edited by Emily Monosson, describes the issues faced by many women combining motherhood with a scientific career, and may be useful for women in a similar situation. A biography of a woman scientist might also be something to discuss. It might be useful to choose a facilitator who is responsible to keep the conversation moving and be sure everyone has a chance to speak. Rotate this position so you donâ€™t anoint a leader. Be sure to give everyone a chance to talking in each meeting. Give each other advice and support without being judgmental. Once your eAlliance gets rolling, you may want to work together on a project. You could plan to give a joint talk at a meeting, or write a paper to encourage others to find ways to organize a mutual mentoring group. It might be particularly useful to reach out to groups that are not covered by our eAlliances. You might also consider organizing outreach or mentoring groups on your own campuses. You can support and encourage each other in these endeavors.